Whether working on a jobsite or shopping in a supermarket, most people never see a slip and fall coming. Preventing slip and fall accidents is crucial to public safety and upholding culpability is the best way to prevent future accidents. 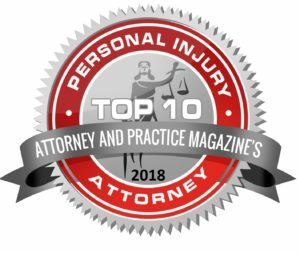 At Patterson Law Group, we understand the need for improved public safety, but we also know how challenging it can be for an individual to take on an insurance company in a slip and fall case. We’re here to help. 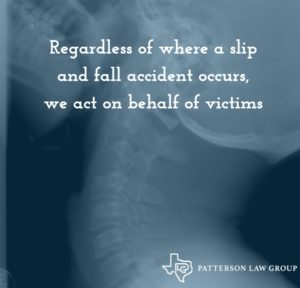 If you’re in need of Slip and Falls Attorneys in Texas, don’t hesitate to give us a call. The term ‘slip and fall’ is used to describe a personal injury case in which the person slipped, fell, or tripped on someone else’s property and was injured as a result. Where the accident happens can influence the outcome of an insurance claim or lawsuit. Slip and fall accidents can happen anywhere, such as in the home, on a public sidewalk, at work, or in a store. Where the incident occurs will determine liability rules, what damages will be available, and what party to sue. 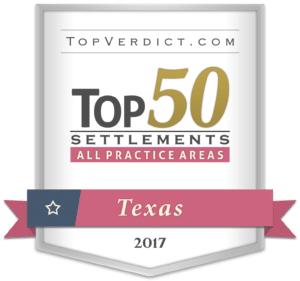 Texas follows a 51 percent modified comparative fault rule; this means that a victim cannot collect damages if they are more than 50 percent at fault for causing the accident. 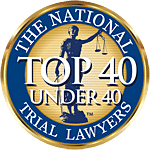 However, a slip and fall victim can collect damages if they are 50 percent or less at fault, but those damages would be reduced by degree of fault. Property owners have a responsibility to exercise a reasonable amount of care in maintaining a safe property. This includes regular inspection of the property, adequately notifying people of any dangers, and remedying those dangers in a safe and timely fashion. When a property owner fails to use reasonable care on their property, and someone is injured on that property as a result, the property owner can be held liable. This is where Patterson Law Group can help. Various circumstances may also place partial fault on the victim. For example: did they not see, or fail to read, a warning sign? We want to know what happened, so we can help you find the applicable relief. At Patterson Law Group, our first priority is getting your side of the story so we can determine an appropriate remedy. Some people are more susceptible to serious slip and fall accidents. The Centers for Disease Control and Prevention (CDC) report 2.8 million older people are treated in emergency rooms for fall related injuries each year. Falls are one of the most common causes of traumatic brain injuries in the U.S. Many who fall, even if they’re not seriously injured, become afraid of falling. This fear may cause a person to change or cut down on their activities. Regardless of where a slip and fall accident occurs, or to whom it happens, we act on behalf of victims, or their families, to uphold their rights and aid in various legal challenges. 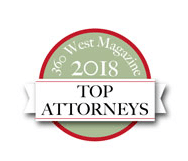 Contact Patterson Law Group today at 817-784-2000, or fill out the form on this page, and we’ll get in touch with you shortly. If I slip and fall at a friend or neighbor’s house can I still file a lawsuit? If you were injured as a social guest at a friend or neighbor’s house, you may still be able to recover from the host. You might initially be hesitant to file a lawsuit against someone you care about. The last thing you want to do is damage a good relationship. However, it can be incredibly taxing to have to have to deal with medical bills alone. It’s important to remember that you aren’t suing the property owner. Rather, you’re suing the property owner’s insurance company. Your friend or family member would not be responsible for paying any damages. There are often a number of people or entities who may be held responsible for a slip and fall accident. Liable individuals and organizations could include stores, hotels, restaurants, bars, clubs, government municipalities, and more. Can I still file a claim if I was intoxicated when I slip and fell? It’s no secret that alcohol and other drugs can severely dampen coordination, sight, and judgement. If you were intoxicated during a slip and fall accident, your ability to recover will likely be greatly reduced. However, bars, clubs, and restaurants have a responsibility to avoid selling alcohol to any customer that is obviously intoxicated. Establishments that over-serve patrons can be held liable for slip and fall accidents. Can I still file a claim if there was a warning sign? If there was a warning sign pertaining to a danger or hazard that caused your slip and fall accident, it is generally still possible to recover for any resulting injuries. Nevertheless, recovering compensation will likely be more difficult. The visibility of the sign should be taken into account when determining liability. In cases where a “Do Not Enter” sign is posted, trespassers are still owed a legal duty to be reasonably warned of any potential dangers or hazards.